"She just gave me a compliment. Did she really mean it, or was she being nice? Do I say thank you? If I do, is she going to think that I'm arrogant? Do I play it off? I really don't think I'm that good at cooking anyway. Maybe I'll give the credit to someone else. How can I downplay this so she won't think I agree with her? Is she expecting a compliment back? Hurry, quick — what can I say to her that will make her feel good and hopefully take all the focus off of me? Why couldn't she just have not said anything at all?" After battling over what to say and how to react, you will do just what you told yourself to do: downplay the compliment and then quickly shoot one back which, although it may be sincere, feels forced and very insincere. You now find yourself in a “battle of the compliments,” which solves nothing, and consequently puts the other person in the very same situation that you just cursed her for putting you in. Our kids really do listen to what we are saying, and some of those things we say and do have consequences we may never have anticipated. Until the other day, I never thought saying "please" could sprout such negative feelings. Ah, yes … the compliment. We've all been taught to give them. “Make sure to compliment the chef,” my mom would say as I left my house to eat at a friend's. Many times I (along with my siblings) was sat down at the kitchen table and told to write a nice note to my teacher or a “thank you” note to a neighbor or family member filled with kind words of gratitude and many, many compliments. Another example of this compliment-giving came from whenever someone in the family had a birthday (and, as one who comes from a family of 10 kids, this happened quite often). We would all sit around the table and take turns giving the birthday child a series of compliments. After all the practice giving compliments, it was easy to be the one on the complimenting end, but when it was my turn to be the receiver? Oh, man, it was torture. Not that I didn't like hearing nice things, but I never knew what to say or how to react. We as parents teach our kids to give compliments. Along with this, we teach them to be humble and not to be boastful — both great and vital lessons to teach. However, where does that leave our kids? In that awkward situation I spoke about at the beginning, wondering how to react. As parents it is equally as important to teach our children how to take a compliment as it is to give one. I found this out the hard way about a year ago when I was out for a run with a friend. She complimented me on my runner's form. Trying to be humble and all those things I mentioned above, I quickly downplayed it, then tossed one in her direction. Immediately, my friend told me to take the compliment. I was a little taken aback by this at first because I felt my actions to be more on the end of humility and, quite frankly, that I had reacted the way that I should have. She went on to explain what a friend once told her: that when someone is complimenting you, they are giving part of themselves to you. Downplaying it and throwing it back at them is not being grateful for the gesture and it is, in effect, a little rude. She then said that when someone compliments you, you should graciously thank them for the compliment, just as you would someone who gave you a gift — because that is what a compliment is: a gift. So, as I teach my children all of the many things I do — specifically to be kind, complimentary and humble — I will make a point to also make sure they know that it is OK to take a compliment. 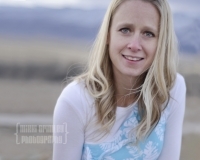 Arianne Brown is a graduate from Southern Utah University, mother to five young kids and an avid runner. Contact her at ariannebrown1@gmail.com, go to he blog at runariran.wordpress.com or follow her on Twitter @arimom5.